An expansion has been announced for Elder Scrolls Online: Morrowind. Morrowind will be released for all platforms on June 6th, 2017. The expansion includes a whole new explorable area, Vvardenfell with roughly 30-hours worth of story which includes assisting a legendary Morag Tong member and meddling with the local politics in the process and saving Vivec City from a crashing meteor by helping a demi-god regain their power. ESO will be getting it’s first new class as well, the Warden. Morrowind also comes with a new playable class: the Warden. 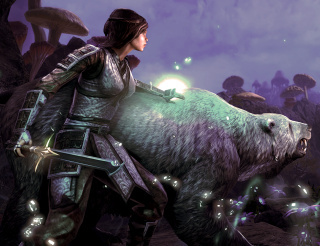 Warden will be nature magic-based and has a war bear companion. A new trial and an exciting new 4v4v4 arena-style PvP battleground are also some of the things we can expect to see come June. TES3: Morrowind fans will be pleased to know that size of Vvardenfell is equal to that of the single player game. The landscape will be familiar, and players will be able to spot the very same landmarks from TES3. In ESO, Morrowind predates the events of the single player game by 700 years. See Elderscrollsonline.com for info on different ESO: Morrowind editions and pre-order FAQ.